January wasn't a great month as we had two weeks of southwesterlies and big seas where no kitefishing could be done. The other two weeks were great for fishing and good numbers of gurnard were caught and a few nice sized snapper. January fishing competition at the local pub. The awesome snapper on the right was caught from the same spot on the beach as last months winning fish. Funny enough it was very close to the same trace as well. January's snapper took the second to last trace on the Bottom Longline Rig, while last months winning snapper was taken on the very last hook on the rig. For the best results from Mokau Beach I recommend you set your gear about 800 metres offshore or more. If you are new to the area, it pays to ask locals where the odd rocks and reef are, in order to avoid losing any gear. That's it from me this month. 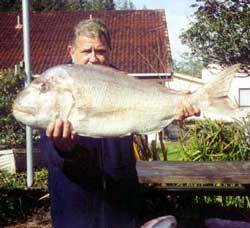 Geoff Preston with his 9.9kg snapper. Anthony has been an avid kite fisher since the outset of Paul's Fishing Kites in 1989. Like many kitefishers, he has gone through some major learning curves, trials and experiments. 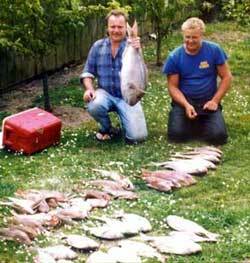 Now considered by us to be one of the most experienced and successful kitefishers in New Zealand. Left: Anthony Fraser Jones and Kent Whittaker caught monsters like this one, while fishing north of Whangarei over the past Christmas period. Using Bottom Longline Rigs baited with salted mullet and squid they set their rigs to around 500 to 750 metres offshore during steady mid afternoon winds. From four or five sets of only 10 hooks per set, they landed 29 fish with the majority of the catch being snapper and just a few gurnard. Anthony says "kite fishing is the most economical, safe, healthy and family orientated outdoor sports going." "I've learnt all about sea currents, winds and fish movements and now pick my fishing days. Fish is my favourite food and kitefishing delivers it!" This is how good kitefishing is south of Raglan Harbour on the west coast of the North Island. Six years ago Anthony landed this great kingfish plus a few snapper on a day when he had the entire beach to himself. Anthony went fishing again at Raglan. He managed to gain access to the beach through a private farm and set his gear on dusk. He retrieved his lines in the dark and wound up with a few gurnard and these two monster snapper. Several years ago, before the regulation changes from 50 hooks down to 25, Anthony baited up with mullet and ran one set of 30 hooks for an outstanding catch of 26 fish. Like many other kitefishers, Anthony can't always get out kitefishing when he wants to. But when he does get out, he likes to make sure he gets a good supply of fish to last through the two to three months when he doesn't have the time. 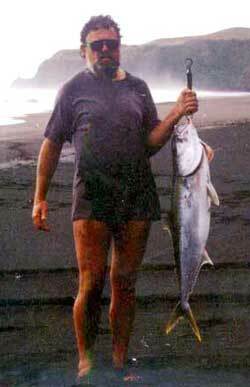 About 10 years ago Anthony and two kitefishing mates went on a two day fishing trip to Muriwai Beach, on the west coast of Auckland. With 3 kitefishing rigs, and two sets per rig, they wound up with a grand total of 105 fish for the trip consisting of a mixture of snapper, gurnard, kahawai and dogfish. I finaly got to Glinks Gully, on the west coast out of Dargaville, around the middle of the day last Friday. David Billings was already fishing with his Big Dropper Rig. His catch up to this point was one shark, a kahawai and two gurnard. It was only blowing about 10-12 knots so I put the Large Skyhook onto my kite powered Bottom Longline Rig and sent it out to around 1000 metres offshore. There was a good rip running that day but the Skyhook made all the difference to the efficiency of the rig. I got out the distance with no problems. On my first set I landed one good sized trevally, a snapper, one stingray and a small shark. The wind was slowing dying away and on the second set I was struggling to get the gear out to the one kilometre mark. This set of my Bottom Longline Rig produced nothing, but it's better than fencing and general farm work. David was fishing with a Power Chute on his Dropper Rig and he had no problems fishing right through the day. His total at the end of the day was ten snapper plus some other assorted species. Ed: It is amazing how many reports we get where those with Power Chutes or Mega Mouths are the only kites that get out in light winds or extreme rip conditions. Every kitefisherman should have one in their kit to avoid the disappointment when the weather forecast exaggerates the wind speed. We went camping at Opoutama Beach on the Mahia Peninsula in the middle of last month. Camping at the Blue Bay motorcamp puts one right on a sand beach with the camp set in a pine grove, ideal for shade. When we arrived at the beach there were two deep drifts of a fine green moss-like weed. This was up to 600mm deep and about 200 metres in length. This was cleaned out by an onshore southerly storm and at the end of our stay was being cast back onto the beach. The day after our arrival produced an offshore northeasterly wind and a lot of bird activity. There were schools of kahawai moving approx. 300 metres offshore, parallel to the shore, all day. It looked promising. Using a Big Dropper Rig rig I put out ten traces fitted with jap hooks. From two sets I caught eight large kahawai, a stingray and one extremely large mackerel. The mackerel was bigger than any of the kahawai! All the hooks were baited with squid. The kahawai certainly went down well the family. I noticed a surfcaster up the beach off one of the moss banks appeared to have as much success, catching and releasing all afternoon. A surfcaster fishing directly off the motor camp caught two stingrays on successive casts - hardly conducive to swimming in the surf! A set several days later to approx 600 metres out, using mackerel bait produced two small sharks. There was no bird activity on this occasion. Our position just clear of a weed bank was just outside the surf break that developed with six surfers arriving. Our activities were terminated by the windsurfers who chose to sail across our front. Fortunately for all of us they did not get caught in the gear. Binoculars are almost essential to spot the setnet floats in the bay and position or limit the kitefishing set accordingly. We did try two sets west of Opoutama, on the black sand beach. A severe tack and Large Skyhook were required to get the gear out. These sets produced no fish and resulted in a snag. We lost both kites. Fortunately the big kite and Skyhook were recovered by a surfcaster. He returned the next day and used a dinghy to retrieve them. What a great guy. He ran out of petrol while on this mission and he certainly earned the beer I shouted him afterwards. On the last Sunday in January we were at Waihi Beach with our family. Between all of us we fished with the torpedo, a Super Kite powered Big Dropper Rig and a longline set from the beach with a kayak. We had ten hooks baited up on the Dropper Rig and a full compliment of hooks on the other rigs. All we caught was lettuce-like seaweed. Sounds very similar to the weed mentioned last week. There were two other kitefishers on the beach using Bottom Longline Rigs. Not sure what they managed to catch. On Sunday 23rd of Febuary we were back at Waihi. There was a southeasterly wind so we sent the torpedo out with 14 jap hooks and salted bonito for bait. We managed to catch two snapper. There was still a lot of the weed around, it was particularly heavy about a kilometre up the beach from the surf club. Some of the locals are referring to the weed as a type of algae. They advise a good strong westerly wind will help in getting rid of this weed off the beach. With regard to Kerry's article in last weeks newsletter regarding the conditions at Waihi Beach. We tried kitefishing off the southern end of the beach in mid February. The sea lettuce was something to be seen to be believed! We couldn't get the Dropper Rig or Bottom Longline out as the rip was too strong. It took two of us to retrieve the gear out of the rip. There were huge bundles of lettuce in amongst the gear. An easterly swell followed by a southwesterly change usually goes well here, but we shall flag it here for a while. There is plenty of weed in the harbour as well. Ed: Thanks for the info. Will have more info on the weed next week. We have a solution for those using Dropper Rigs in weedy areas. It is called the Running Float Dropper Rig. This system will help avoid getting the weed through you hook section and drop line so you can carry on fishing your favourite areas. We headed to Fitzroy Beach in north Taranaki on Saturday 22nd February for a bit of kitefishing. We started too late in the day. It was around 10am when were setting up the gear. Managed to get the kites up - a large delta and Large Skyhook, but due to the angle that the kites would have set at, we decided to add some tack to the kites. We pulled the kites down and while we were working out the amount of tack required the wind dropped away to less than 5 knots. By the time I was ready I couldn't get the kites back up again. Within 45 minutes the wind had shifted to a 45 degree onshore wind of about 4-7 knots. On the week before, Sunday 16th February, we went for a fish at Waitoitoi Beach in North Taranaki. In a moderate southerly wind I managed to get the gear straight out off the beach. I put out one set of 18 hooks on the Kite Dropper Rig. All hooks were baited with mackerel. I caught one snapper which was great. I went out in 12 foot aliminium dinghy around 5:30pm on Saturday 15th February. There was a strong wind blowing and it was very choppy out from Hudsons Beach on the Manukau Harbour. Using bonito for bait I fished for over two hours. I caught a few small snapper, a small trevally and one large kahawai. The kahawai found itself smoked and in a pie the next night, but alas the others had to go back to do some breeding. No sign of the normally plentiful gurnard and no good snapper bites at all. Due to the chop and the strong offshore wind I was confined to the edge of the Waiuku channel. I find the current mid channel too much of a drag and I tend to stick to the shallows between the channels and the edges. On Saturday 8th February the smallish, but legal, snapper were in good supply on the incoming tide in the same position. Two of us caught seven snapper over the course of an hour before rounding up some end-of-season scallops. Waipu Beach on Northland's east coast is reported to be working for boaties. Limit bags of snapper are being taken about 400 metres offshore. Early in the morning seems to be best according to the reports I have had. There is no reason why the kitefishers cant target these fish either. Early morning or late evening has always worked well for me at Waipu. I have also heard there are quite reasonable fish in the upper reaches of the Kaipara Harbour. I am keen to get out and set a Boat Longline to see if I can catch some of these good fish. All I am waiting for is some time off to go fishing. Been so busy on the farm. Cant wait to get out fishing again. Reports from both coasts indicate the snapper are now in close. Rob in the shop reports a kitefisher came in to advise he had been kitefishing at Muriwai Beach and caught good numbers of nice sized snapper and gurnard. 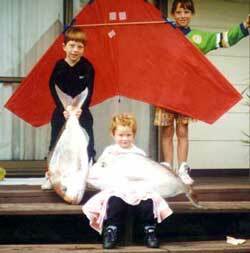 A Kite Fishing Club member was fishing at Orewa a couple of weeks ago and landed five snapper up to 2kg. Trevally are also being caught from in close on the west coast. Some gurnard and kahawai have been landed but there seems to be more snapper around now. All good news for kitefishers. I was going through the archived newsletters and was reading about East Clive in Hawkes Bay, where Noel Watson lost his kite. I seem to remember approx. ten years ago the army had a bombing exercise in the area. They used 44 gallon drums for target practice. From memory they sank about 300 drums in the vicinity. I wouldn't be surprised if Noel snagged his gear on one or more of these. Just thought I would warn other fishers. Are there any other people kitefishing in Marlborough during the weekends? We can catch shark and the occasional kahawai. We suspect the kahawai are hooked when we are bringing the line in. We also catch red cod occasionally. 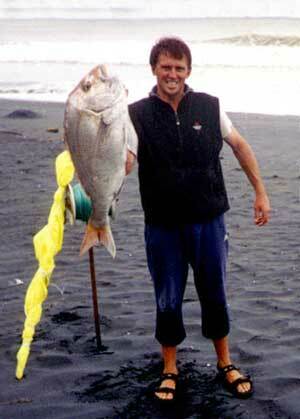 We fish off Rarangi Beach and have tried kitefishing at Marfells Beach, which is ideal in a southerly wind. Landed a great haul of skate from Marfells Beach. Allan was not impressed with this haul, although it does look visually impressive when they are being hauled in. We use squid for bait and tide doesn't seem to make any difference. Can you put us in touch or a note in your newsletter please? Another weather site. This one is very good for forecasting. It shows that there should be 10+ knots east to northeast both Saturday and Sunday. I think your website is great. It really helps people who are new to the game like me. When I have a catch to report don't worry I'll send it in. At the moment the winds have generally been blowing westerly which means fishing the east coast. It is that time of year when the beaches are jam packed, so I haven't bothered to put out a line. Hence the only suggestions I have for your newsletter could be a feature on 'where to fish' i.e a place where novices like myself can find information on good place to kite fish. I have also noticed the MET Service is pretty useless for giving accurate forcasts, unless you want to pay each time for a more detailed one. I have found their recent forecasts to be way off the mark. So more sources for weather forecasts would be good. Thanks and keep up all the good work. I look forward to the newsletters and seeing all the catch reports. Paul's Fishing Kites are offering a $30.00 gift voucher for the best photo of the month that makes it into the kitefishing report in the NZ Fishing News magazine or onto our website. The prize is available for photos of catches taken on one of our kitefishing rigs or with our Target Hooks, from March 2002 till March 31st 2003. There is no limit on entries so you can send in as many pics as you like. The pic is a great shot taken on 90 Mile Beach and includes the kite, rig, catch and people. A $30.00 voucher will be out to you very soon. This Sunday is the monthly demo day held by the Kite Fishing Club. Listen to 1ZB, 1080AM, between 7am-8am to find out where they will be fishing. If the day is postponed due to a lack of wind the demo day will be the following Sunday. Interested members of the public are welcome to join them and learn about kitefishing. Those new to kitefishing will pick up some valuable tips. They are a friendly bunch of people and just love to talk about their rigs. Go along and see what they are doing. Dont forget your lunch and sunscreen.